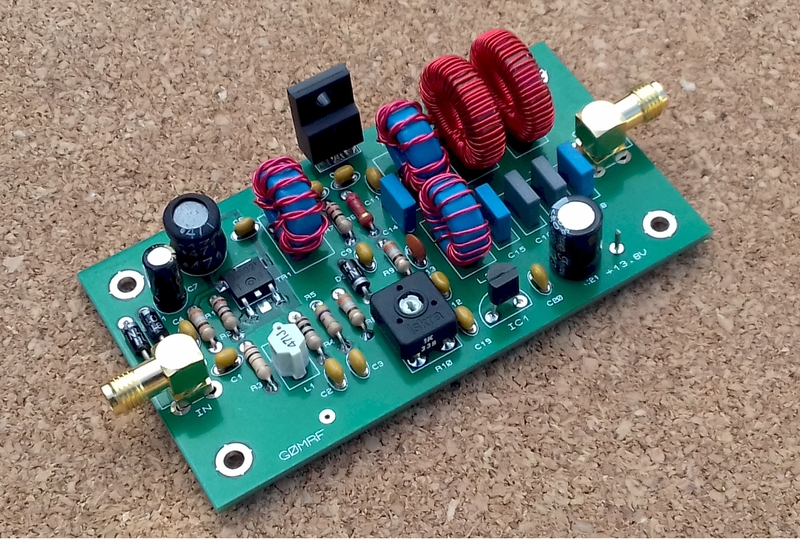 If you are getting started on MF or LF and plan on using the low level output from an SDR radio, or a homebuilt transverter, then you will probably need an amplifier with high gain and enough power output to drive a larger power amp. This amplifier has been designed to amplify signals of a few milliwatts up to 5 Watts. The design has 32dB gain and a frequency response from 80kHz to 2MHz. It can be used to drive larger amplifiers or it can be directly connected to an antenna for QRP operation. The DC Power requirement is typically 13.8V DC at 0.7A. The amplifier is a 2 stage design and uses NPN transistors in preference to FETs. The first stage operates in class A and has 12dB gain. The transistor selected is a general purpose NPN from ON Semi, which is available from RS components in The UK and Digikey worldwide. In the circuit around TR1, R4 provides emitter degeneration while R1 R2 and C4 provide negative feedback from collector to base. These components set the gain, input and output impedance as well as ensuring stability. The resistor values chosen set the standing collector current, or quiescent current, between 80 and 90mA. When tested independently, the first stage amplifier -3dB points were measured at 50kHz and 23 MHz. Output power is linear to over 100mW, while saturated output is around 230mW. The second stage amplifier uses a Toshiba TTC3710B, although at these frequencies any transistor with similar characteristics should perform well. It operates in class AB, although the exact bias point can be adjusted for best linearity or best efficiency as required. In the prototype, the quiescent current was set to 50mA, which is sufficient to amplify small signals well, but gives higher efficiency as the input level is increased. This setting is a good compromise for modes like CW JT9 FT8 etc. If higher linearity is needed, then the bias current can be increased by adjusting preset resistor R10. The gain of the second stage is around 20dB. Impedance matching in the final amplifier is achieved using broadband transformers wound on 12.5mm (½ inch) diameter toroid cores. The ferrite used is N87 material from EPCOS (TDK), this has a similar performance to the 3C90 material popular in Europe, but is available from Mouser. If you are in Europe, you can use mouser.eu or fit the 14mm 3C90 cores available from Farnell. Both transformers are identical, however T1 on the input is connected as a 4:1 step down, while the output matching transformer T2 is connected as a 1:4 step up. The 1:4 ratio of T2 is close enough to match the output impedance at the collector to a 50 ohm load. To enhance stability in the high gain final amplifier, three different techniques are used. Firstly, a 22R resistor damps the input signal at the base. Secondly, R6, a 220R resistor provides negative feedback from collector to base. Finally, C13 in the collector circuit rolls off higher frequencies. The TTC3710B final amplifier has an fT of 80 MHz, a max power dissipation of 30W and collector current of 3A, which is adequate for use at the frequencies of interest. The device is housed in a TO-220SIS package, which is similar in appearance to a 78XX series voltage regulator. However, the TO-220SIS has an insulated thermally conductive plastic tab (collector) instead of the usual metal version. This makes mounting the device very simple. Just bolt directly onto the chassis or a heatsink. No expensive insulating kit required. The output matching transformer T2, is followed by a low pass filter for your frequency of choice. The filter for 630m is a 5 element Chebyshev design which uses Micrometals T68-2 iron dust cores. This filter is suitable for connecting the amplifier to an external PA or an antenna. 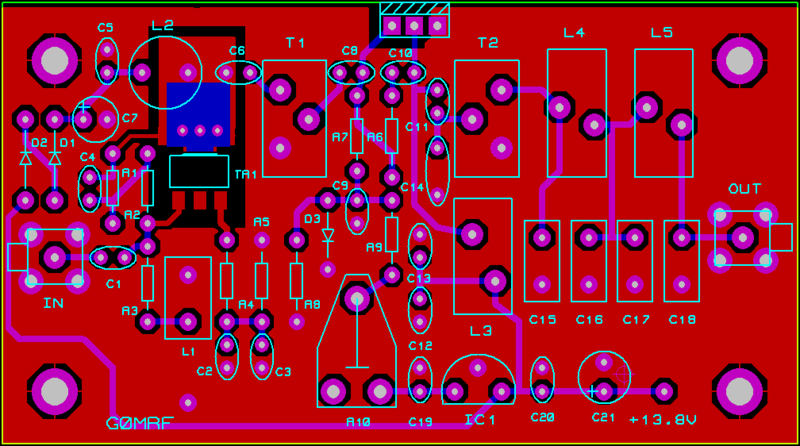 Values given on the circuit diagram are for 630m. For 136 kHz, suitable filter values are given below. It is worth noting however that the 67uH inductors are better constructed from a core material with a higher permeability than the T68-2. Suitable alternatives may be the -1 material from Micrometals or perhaps, given the modest 5W output, a fair-rite -61 ferrite material usually found in HF band amplifiers. In the graphs above, the circuit has been built with the suggested low pass filter for 475kHz. The supply voltage was 13.6V and the PA bias was adjusted for 50mA with no signal. With 50mA bias the amplifier has good linearity to 33dBm (2W). Above that level there is gain compression within the power amplifier. Saturated output power with a 50 ohm load is around 7 Watts.